Spectacular Home with Brick & Cedar siding on a Horse Farm with over 10 acres. 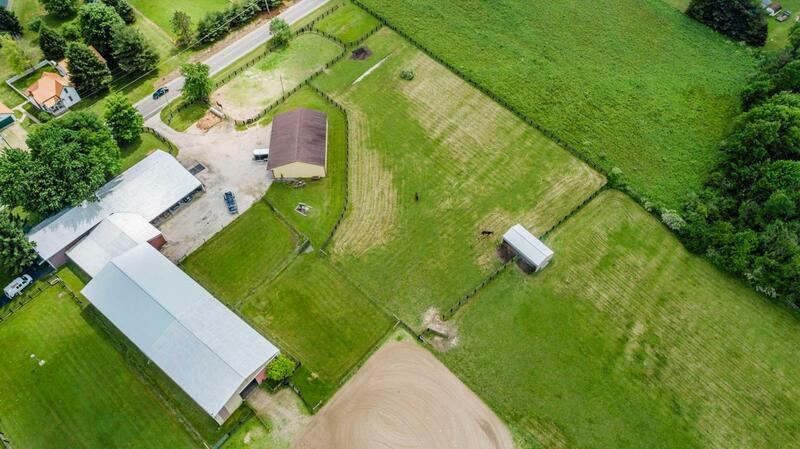 Features Horse accommodations, grazing & open spaces, a large covered front Porch to enjoy the views, 3 Car Garage, 2 spacious outside Buildings, 1 of which hosts 21 horse stalls, sizeable indoor Arena w/heated Observation room, secured Feed & Tackrooms, huge outdoor Arena & 9 fenced pastures with run ins. This beautiful home features, 3 Bedrooms, 3 full Baths, Hardwood Floors, Formal Living & Dining Rooms, newly updated Kitchen w/ Stainless Steel Appliances & Eating Space, 2 Family Rooms w/brick Fireplaces and built-ins, recessed lighting & a Bar area. Bright 4 Season Rm, Massive Owner Suite offers a Sitting/Office area and Master Bath. A must see to appreciate all this home has to offer! !